GEDI (Global Ecosystem Dynamics Investigation) is an ISS attached instrument that produces the first high resolution laser ranging observations of the 3D structure of the Earth. GEDI’s precise measurements of forest canopy height, canopy vertical structure, and surface elevation, greatly advance our ability to characterize important carbon and water cycling processes, and biodiversity and habitat. GEDI’s data on surface structure are also of immense value for weather forecasting, forest management, glacier and snowpack monitoring, and the generation of more accurate digital elevation models. GEDI provides the missing piece – 3D structure - in NASA’s observational assets which enables us to better understand how the Earth behaves as a system, and guides the actions we can take to sustain critical resources. The GEDI instrument is a geodetic-class, light detection and ranging (lidar) laser system comprised of 3 lasers that produce 10 parallel tracks of observations. Each laser fires 242 times per second and illuminates a 25-m spot (a footprint) on the surface over which 3D structure is measured. Each footprint is separated by 25 m along track, with an across-track distance of about 600 m between each of the 10 tracks. GEDI will be installed on the International Space Station in late 2018 and is expected to produce about 15 billion cloud-free observations during its nominal 24-month mission length. GEDI responds directly to observational priorities set by the National Academy of Sciences and NASA’s Science Mission Directorate, which emphasize the need for lidar vertical structure measurements to address key challenges in carbon cycling and biodiversity. The information derived from GEDI’s state-of-the-art lasers further catalyzes observations from the next generation of NASA missions, including the NISAR and the ICESat-2, among others. Additionally, GEDI has a formal collaboration with the German Aerospace Center (DLR) to marry its lidar data with the DLR Tandem-X SAR interferometry mission to produce wall-to-wall maps of canopy heights and other structure. 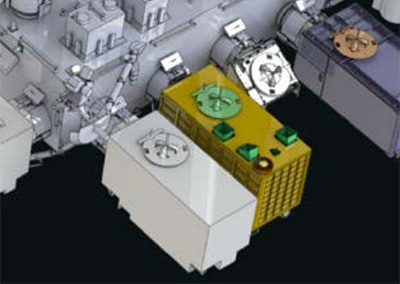 GEDI will be transported in the unpressurized trunk of a Dragon cargo craft to the ISS, where it will be mounted on International Space Station (ISS) on the Japanese Experiment Module - External Facility (JEM-EF).